Next week, masks of all kinds will likely cross your doorstep—creepy clowns, ghoulish goblins, probably even a Donald Trump or two. 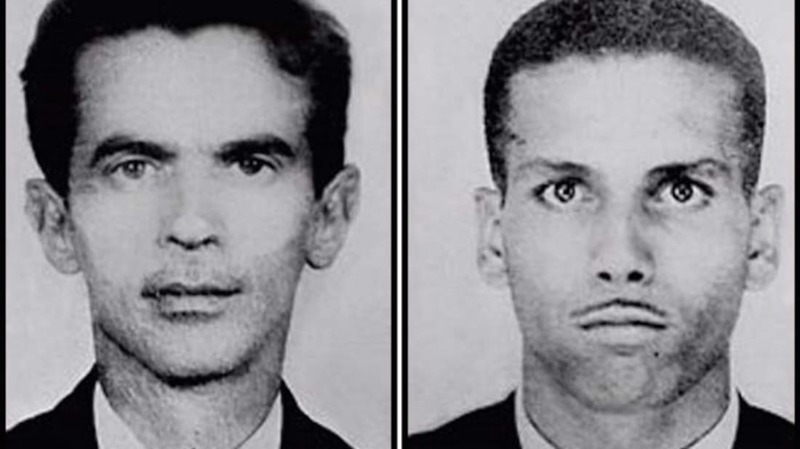 But none of them will be as strange or disturbing as the lead masks found on the bodies of two Brazilian electrical engineers in 1966. On August 20, 1966, an 18-year-old man named Jorge da Costa Alves was enjoying an idyllic afternoon flying a kite on Vintém Hill in Niterói, Rio de Janeiro. His meandering eventually led him to a patch of tall weeds, where he stumbled upon a grisly scene: a pair of bodies lying side-by-side on the ground. What the two dead men were wearing took the discovery from tragic to truly bizarre. As word got out about the perplexing find, people started to come forward with more details about the men. Their names were Manoel Pereira da Cruz and Miguel José Viana, and three days prior, they told their relatives that they needed to buy work supplies and would be gone for the afternoon. Instead, they boarded a bus and headed to Niterói. They stopped at a bar, where they purchased the water. The waitress there noted that Viana seemed especially nervous and kept checking his watch. Nearly 50 years later, that’s still all we know about the mysterious men and their lead masks. (No toxicology tests were ever done to determine if they had, as the note indicated, taken any capsules, or what those capsules might have been filled with.) Were they a doomsday cult? Did they believe in time-travel? Was this an elaborate murder staged as a suicide? Or perhaps they had a plot to do something sinister with a nuclear reactor? There’s no shortage of theories, some more out there than others. The most popular one is that the men believed they had a meeting with a UFO—they allegedly believed in extraterrestrials, and Vintém Hill was the location of several supposed sightings. There's been no evidence to support any of the theories, however, and the "Lead Masks Case," as it's called, continues to confound to this day.